Highly crystalline ZnO/mesoporous hollow silica sphere (MHSS) composites have been successfully synthesized through an impregnation method at 323 K without applying calcination. Three composites of different Zn/Si molar ratios of 1 : 2, 1 : 1, and 2 : 1 were prepared. X-Ray diffraction patterns confirmed the presence of highly crystalline ZnO in the materials. A layer of ZnO was formed on the MHSS as evidenced by field emission scanning electron microscopy analysis. Transmission electron microscopy analysis verified the mesoporous structure in ZnO/MHSS composites. N2adsorption–desorption analysis indicated a type IV isotherm for 1ZnO/2MHSS and 1ZnO/1MHSS samples, confirming the presence of mesopores in the ZnO layer. 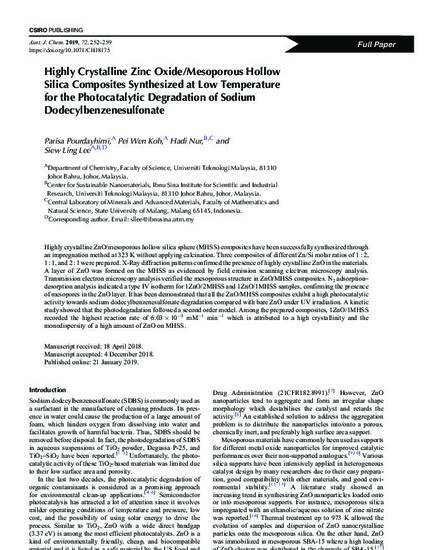 It has been demonstrated that all the ZnO/MHSS composites exhibit a high photocatalytic activity towards sodium dodecylbenzenesulfonate degradation compared with bare ZnO under UV irradiation. A kinetic study showed that the photodegradation followed a second order model. Among the prepared composites, 1ZnO/1MHSS recorded the highest reaction rate of 6.03 × 10−3 mM−1 min−1 which is attributed to a high crystallinity and the monodispersity of a high amount of ZnO on MHSS.